American made cone denim workshop apron. 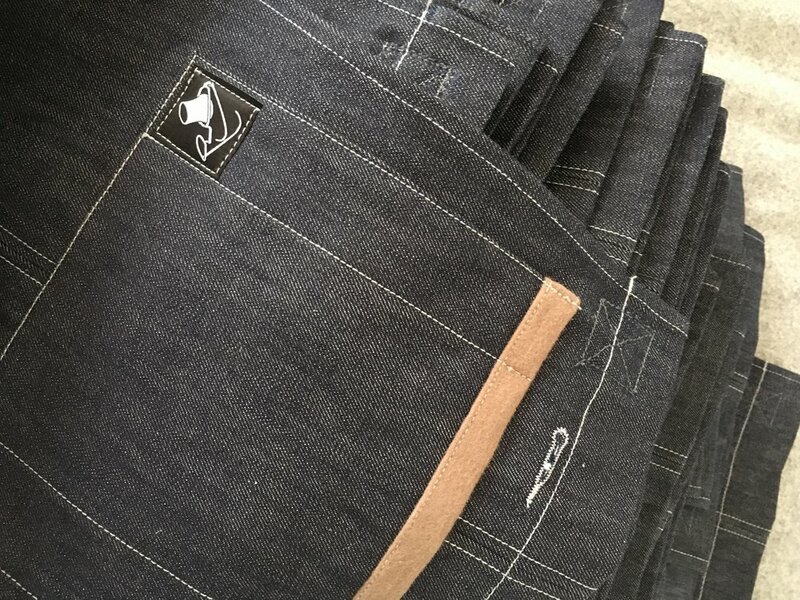 American selvedge cone denim from the (now closed) White Oak mill. Split leg so you can jump on a bike for a test ride. Soft lined 'phone' pocket, button hole headphone access, big side pockets, stainless hardware and broad shoulder straps for "all day comfort". Designed and fabricated in San Francisco USA. I could never find the right 'cover-all' for the shop. Over-alls are too hot. Most aprons are designed more for the BBQ than the machine room ... so I designed one. Solid 12oz American made cone denim, in either contrast or plain stitching. 2 options for highlight colors on the flannel lined chest pocket. The apron is high on the chest, wraps around the side and has a split leg opening with knee straps for perfect for protection of your fancy Distinguished Gentleman's togs. I moved the main pockets to the side - I find center pockets are just a bondo dust collector and you end up with metal pieces in there which poke through and scratch that expensive paintwork. The stainless steel hardware is removable for easier washing ... although I don't know why you'd was the grime off - builds character. Broad crossover 'synthetic' cotton shoulder straps (100% cotton stretches and Nylon melts). I can do leather straps too if you're interested. Constructed by Alex at Nettle Studio in San Francisco. Buckles cut at Fuller Moto on their fancy waterjet.